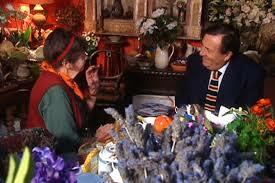 Margaret Olley and Barry Humphries, both contributors to Australia’s cultural life, were among one hundred prominent Australians designated as National Living Treasures by the National Trust. Margaret Olley, best known as a still life painter and benefactor, and Barry Humphries for his theatre, film and television performances, share a strong interest in creating, collecting and museum study of the visual arts. For this exhibition the artworks have been selected from both public and private collections in Australia covering a broad time-frame from Degas, Matisse and Bonnard to the present day. ‘Lloyd Rees, the ‘old man of the arts’ is a favourite and Margaret Preston, who is someone I am always sorry that I did not meet. I have also included some young painters whose work greatly interests me. The exhibition co-ordinated by Christine France, promises to be an exciting, eclectic showcase of painting and sculpture.